← Democratic e-letter 28 November 2013: Happy Thanksgiving! 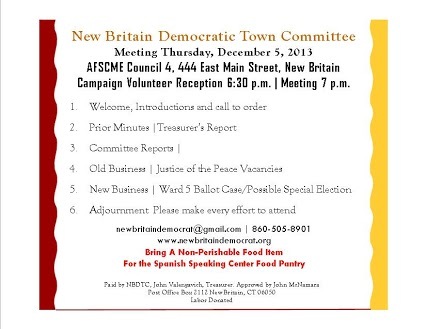 The Democratic Town Committee will meet Thursday, December 5th at AFSCME Council 4, 444 East Main Street. The meeting will start at 6:30 pm with refreshments and recognition for 2013 campaign volunteers. Regular business will be taken up at 7 p.m. The agenda will include the filling of vacancies for Justice of the Peace in the current term and the status of the Ward 5 Aldermanic race. On November 25th counsel for Democrats, Republicans and the city’s Republican Corporation Counsel filed briefs in court. The situation stems from Election Day when 17 voters at Diloreto School received Ward 2 ballots instead of Ward 5 ballots. The court will either order a new election or uphold the results in which incumbents Carlo Carlozzi, Jr. and Roy Centeno were certified the winners.